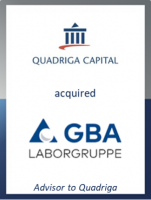 GCA Altium acted as financial advisor (M&A and debt) to Quadriga Capital on its acquisition of GBA Gesellschaft für Bioanalytik, one of the leading laboratory service providers in Germany, from Adiuva Capital. GBA Gesellschaft für Bioanalytik mbH (“GBA”) has, since its inception, developed organically and inorganically into one of Germany's leading laboratory service providers. The company engages in food, environmental and pharma laboratory analysis and testing services, operating in 11 locations across Germany and Austria. As part of GBA’s further expansion strategy, Quadriga Capital Private Equity Fund IV L.P. acquired the shares held by Adiuva Capital. CEO Manfred Giesecke will stay significantly invested in GBA, along with the remaining management team which has acquired a minority stake. "GBA is a high quality business that offers very strong growth fundamentals paired with extremely high quality standards, strongly valued by its customers. We are delighted to provide supporting advice to GBA’s management team in its national and international roll-out”, commented Dr. Alexander Friedrich, Partner of Quadriga Capital Beteiligungsberatung GmbH, who acts as an Investment Advisor. This latest transaction sees GCA Altium build on its leading position in international business services advisory, having completed 21 transactions in this sector since the start of 2015.